Residents of Acton have decided that, as well as living with rubbish, they would like to look at photographs of it on the Actonw3.com website. We're delighted to say that the first photograph we published of assorted rubbish outside the entrance to Acton Park was moved today. The photograph was emailed to us by Angela Jullings. 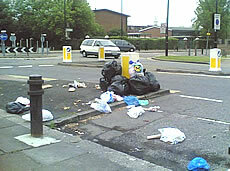 Angela reported this particular rubbish to Ealing Council on Thursday, June 8th. Angela is passionate about the subject of rubbish and is taking steps with councillors, Acton Area Committee and with the Environment team at Ealing Council to try and improve the situation (see the Forum on this site for further details). In addition, she and her partner also take action themselves. Angela admits, "sometimes my partner Ken White and I put on rubber gloves and resort to clearing up the rubbish in our street ourselves when we get fed-up of waiting for street cleaners to come." She is taking this matter up with the Acton Area Committee and local Councillors Seema Kumar and Vlod Barczuk (see 'Filthy Acton' strand on the Forum). 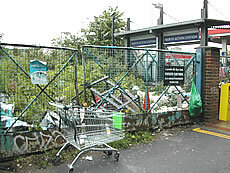 Picture number 2 is of flytipping beside the walkway entrance to North Acton Station, in Victoria Road. Bob Crossley, who sent in the picture, has tried to trace the company 'Landis & Gyre' but cannot find them. Sanjay Chalisey has sent in Picture no. 3. Someone has had enough of their tv and dumped it in the road. Sanjay says that Ealing Council's failure to collect flytipping quickly shows "lack of care towards the safekeeping of our local environment". He didn't photograph a dumped sofa further down at the junction of Southfield Road. We won't forget, either, the irresponsible people who commited these acts. Council ref 541823. - Report the rubbish and its location. Make a note of the job reference number. - Email your photograph to editor@actonw3.com with a note of the date and time you reported the rubbish, plus the job reference number. We will try to keep this section updated as regularly as possible.